A normal P wave is positive (upright) in leads I and II, but negative (inverted) in aVR. It should be less than 3 small squares wide (120 ms), and less than 2.5 mm tall (or <1.5 mm in the chest leads V1-V6) at standard settings. This ECG is from a man in his 40s who presented with crushing chest pain described as 'like my other heart attacks'. He had also missed dialysis. 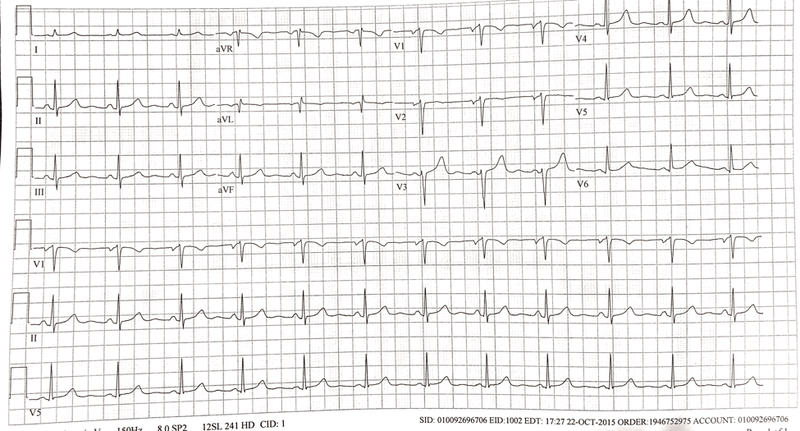 This ECG is from a man in his 40s who presented with crushing chest pain described as 'like my other heart attacks'. He had also missed dialysis. This was his baseline ECG.